Greetings Viners! This will probably be a very weird, yet refreshing CaV as I'm pretty sure that this has never been done before. So with that being said, it is a battle of the felines! Standard Equipment for them both. @joewell Here it is, you got the opening! Armless Tiger Man, a.k.a. Eric Hertz's background is a tale of true heart wrenching sadness and epic adventure. It all started in Nazi Germany. Eric was slaving away in a laboratory, like he did every day. Suddenly, something terrible happened! His arms were sucked into the machine, destroyed. Instead of letting his new disabilities break him, he trained. He worked hard. He fought. And he grew past them. Eric, after reading a manual, learned how to use his mouth and legs better than most able-bodied people could use their arms. Afterwards, he sought revenge upon all machines in the world. He'd go in and tear everything mechanical to shreds. 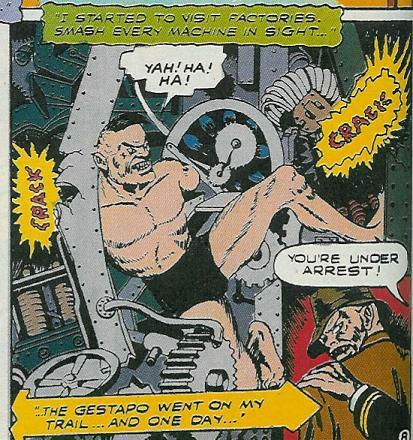 The Nazi's eventually seized him and placed him in America, where he continued to destroy machines until the "hero" (Can anyone who goes against Armless Tiger Man still be called such?) Angle put a stop to it. "No one can stop him in his campaign of destruction!" That includes you, Puss in Boots. While Armless Tiger Man has no true powers, he has trained his body to peak human condition, if not above. Even without arms, he is a fearsome opponent that'd difficult to beat. Strength: Eric's strength in his legs and jaws is immense. He can easily rend metal machinery and one shot normal humans with his feet and can dig through the ground and rip through flesh with his teeth. Speed: With speed like Eric's, maybe he should be called "Armless Cheetah Man!" He can blitz groups of people before they can react and get the jump on Angle. Durability: He can give punishment, but can he take it as well? Of course! Here he survives a direct punch from Angle, who can punch through the hull of an airplane. Any normal human would have had their skulls crushed, but Armless Tiger Man just went back for a tactical retreat! 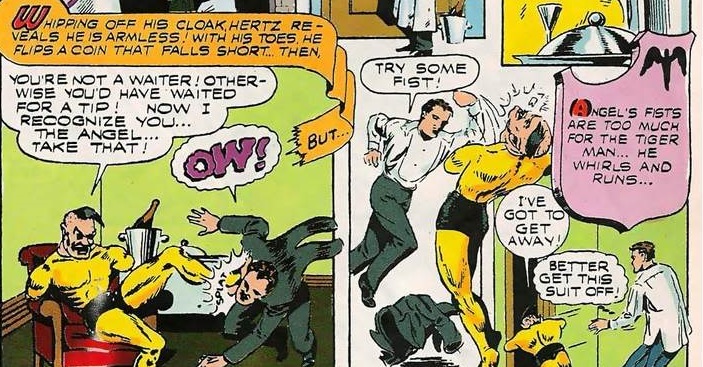 Skill: Obviously, Armless Tiger Man is one of the most skilled fighters in the Marvel Universe. His rigorous training can be seen above and it's put to the test against the Wakandan Army. He mercs at least a hundred of them with no setbacks. Now, not only is this taking out waves of normal fodder, but waves of high class fodder. 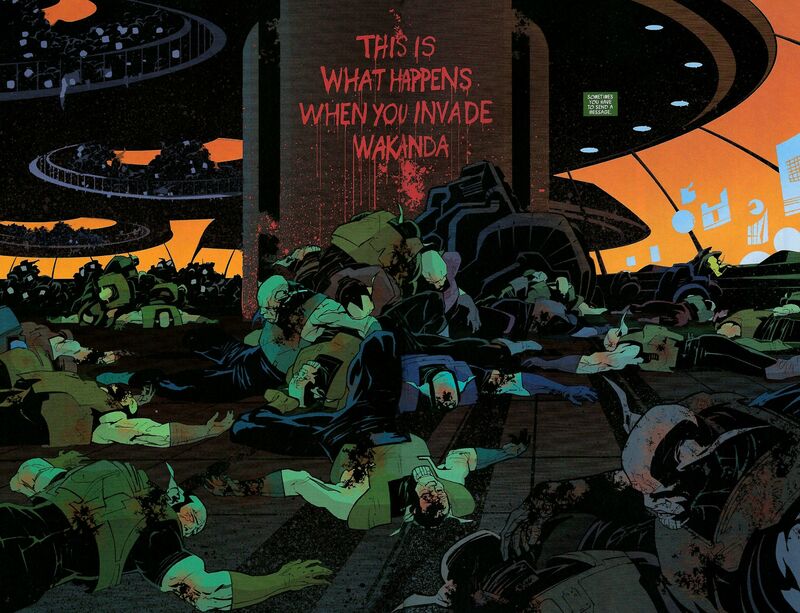 The Wakandan state has never been taken over even once, and they are far superior than any normal troops. And yet, there Eric stands. Over a mound of their corpses. Like a boss. Along with his impressive F2H (Foot to hand) combat skills, he can wield weapons and tools quite impressively. He can throw them accurate enough to hit a bulls-eye of a target and hard enough to wreck machinery. And I think that's good. In my next post I'll get to the analysis of the fight and counter your post. Until then, it's all you! @wolfrazer: Whatta bout Puss and Boots vs Jack Sparrow? @joewell: Hm interesting, interesting. K guess I'm up. Puss' backstory is rather easy, he's an orphan cat and after saving the mother of the Comandante of his town, he was regarded as a hero, although things took a turn for the worst and was later labeled as an outlaw of his town. But he's a hero none the less and he seeks out adventure, protecting those from harm. To summarize quick here before getting into feats, Puss while he is a cat, has peak human strength if not a little over. His speed is also nothing to sneeze at as he has also blitz'd groups of men before they could react, he has raced upon and up walls, avoided magic energy blasts and so on, his reactions are also pretty good too and he's also a masterful fighter in just about everything from swordplay to H2H combat. As a mere kitten he takes down a charging bull. A full grown male bull can weigh up to 2,400 pounds. Although yes the bull was charging and therefore momentum was also a factor, Puss would still have had to have strength just to even turn the bull and bring it down. Here he carries his horse Babiaca on his back. Looks to be a Throughbred horse and those can weigh up to 1,000 pounds. One shots a full grown man with a headbutt. Here Puss moves fast enough to get up from where he was sitting, travel over to the other table, cut off 2 mustaches and then place his sword up against a man's neck before they could even react to him. The speed he'd have to travel is pretty great, given his size and the fact that he was between 2 tables. Agile, evasive in combat even able to run up walls with how quick he is. That's enough for now, but there's more to come later. I'll touch upon durability, reaction and more fighting skill/strength/speed in my next post. @wolfrazer: Nice! Round 2, coming up! A nice day of soccer with Eric.. The two seem pretty even actually. My analysis concludes that they are about even in speed (Blitzing humans, agile fighters, etc. ), while Armless Tiger Man holds the advantages in strength (tearing up steel with ease. ), skill (whooping the Wakandans. ), and durability (you've provided nothing fort this category just yet.). Puss in Boots, on the other hand has no big advantage stat-wise other than maybe reactions, and even that's iffy considering ALTM directly dodged a bulrush from the peak human Angle. I'd also like to talk about this for a second. You're probably thinking since the kitty dodged those projectiles he can dodge all of Tiger Man's, right? Wrong. Tiger-Man is far more accurate and throws his projectiles faster than those shown in your gifs so far. He'll be much more effective at tagging Puss with his thrown weaponry and once he does, it'll probably one shot. The match will begin. At this distance, Armless Tiger Man will decide to throw some projectiles. In an area like this, finding things to throw shouldn't be a problem. Until you can show Puss dodging attacks from someone as accurate as his current opponent, there's a big chance Armless Tiger Man gets cat soup tonight. If Puss can somehow avoid the projectiles and get close, he'll just be defeated there too. Armless Tiger Man simply has better feats in close combat as I've already explained. Not only is he more skilled, but he can one shot with his strength too. Heck, it's highly likely Puss's sword gets kicked in half, considering what ALTM does to machines. Then he'll be up a creek without a paddle, soon to be torn to shreds by Tiger Man's vicious attacks. Armless Tiger Man has better strength, skill, and durability while their speed is about equal. Eric can kill him at a distance with incredible accuracy. Eric can kill him up close with his superior skill. Quick and easy, you're turn. Puss in Boots, on the other hand has no big advantage stat-wise other than maybe reactions, and even that's iffy considering ALTM directly dodged a bulrush from the peak human Angle. This is nice, but Puss has reacted to a crossbow bolt being fired at him, even catching the bolt with his teeth. Crossbow bolts from the medevial ages, can move anywhere from 39 m/sec to 61 m/sec. He's done it more than once too. Either way this is far above peak human speed given I don't recall any peak human running at 80+ mph. Eh I wasn't thinking that at all, but given his reactions, I think Puss can avoid or deflect such things thrown at him. As he has deflected projectiles. So either way he can react to such speeds and objects thrown. Puss has also reacted to and grabbed fast moving ninjas. Said Ninjas were able to steal things before anyone could react, including a horse. As far as skill go...not likely, Puss knows pressure points. Puss also contented with a magic swordsman who slaughtered over an army of men single handily. Puss also knows various fighting styles. IE: H2H and Wrestling techniques along with of course his mastery of the sword. As far as durability goes, Puss can take a hit quite well. Here Puss gets punched in the face sent flying, then grabbed and thrown into a couple of boxes yet still able to move. Here Puss gets thrown from a portal, smashing into a wall and then his horse crashes into him yet he appears fine. Withstands multiple hits from ninjas coming out unharmed and able to react to them still. So I'm pretty sure Puss here has the good enough reactions, speed and physical capability in combat to beat ALTM, he doesn't need to be exact in stats to do damage, he has both sword piercing options and his own melee strikes. Couple with his reactions and agility, that and his small size, I can see him taking the win. But ah, I'm ready for votes if you are. @wolfrazer: Ready for votes? These typically go on for at least 2-3 counters. I plan on doing at least one or two more, if that's ok. But I guess you can do one more and then we can go for votes. Least this way we'll both have 2 posts to the argument and the voters can decide from there. @wolfrazer: Have you tried Makeagif? It works well enough for me. Sometimes it'll say it doesn't work, but if you reload and try again it does. Okay-dokie. It'll be up tonight. @joewell: Yeah one of the first I tried, didn't turn out well. But mmk, then we shall let the voters decide! @wolfrazer: Well, that was quick. GG! Ooh, that's nice. I'll definitely give you reactions then. But it's close. I think he could do so with many, but I also don't think it's impossible for Armless Tiger Man to tag him at a range. With his accuracy, I think he can still hit him around 4/10 times. This proves that his reactions have failed him even to things he can react to before. 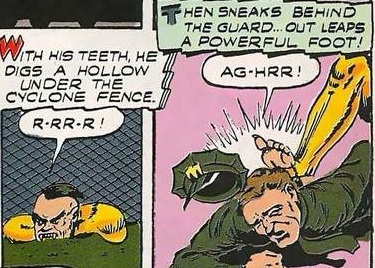 If the ninjas can blitz him even though he's been able to react to them, I think Armless Tiger Man's projectiles have some kind of a chance at hitting him too. Deflecting it off his sword, not bad. But, do you know what would happen if he tried to do that here? His sword would snap and he'd be dead. Armless Tiger Man throws hard enough to "wreck machinery", so Puss's flimsy little sword definitely isn't holding up. He clearly knows the pressure points of the hand. I can see that. 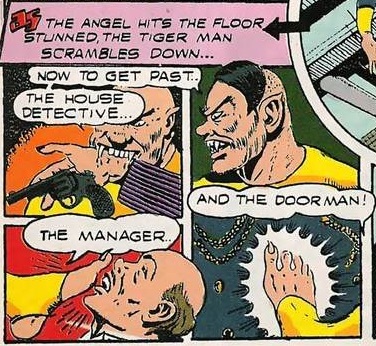 But I'm not sure if you've seen any pictures of Armless Tiger Man recently. Here, I'll help you out. Wait, did you see that?! Enhance! Puss's pressure points prove pointless. Just contend huh? By the fact that you said "contend" and that you didn't post the full fight, I assume Puss didn't actually beat this swordsman (Or you just couldn't find the video..). Either way, until I see proof of him winning said fight I'm going to assume he didn't win. 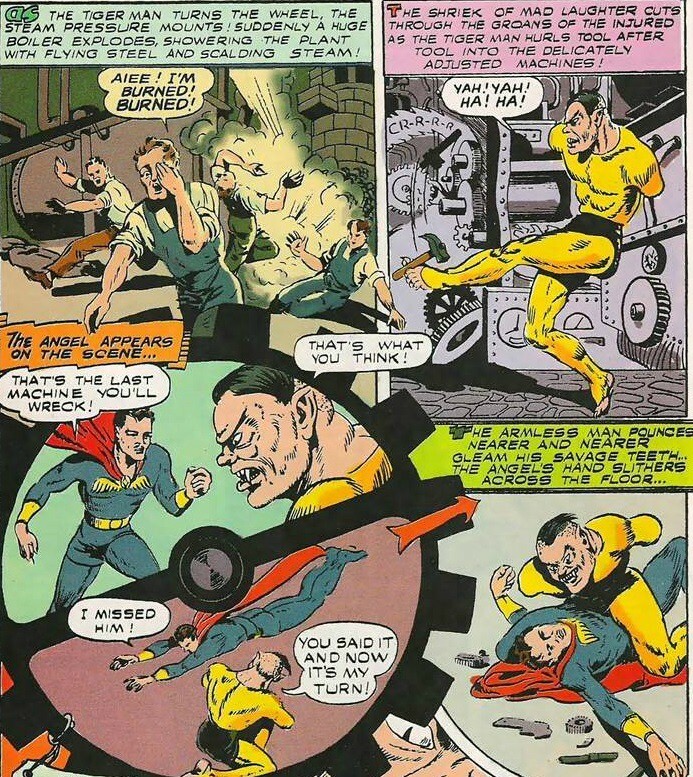 And if that's the case, then Armless Tiger Man is easily more skilled, as he slaughtered an entire army of not only men, but of the best soldiers in the Marvel Universe! That puts him above both this mysterious swordsman and Puss himself and clearly gives him the advantage in skill. Pretty sure he was just saying stuff to impress that girl. But even if it was true, what exactly are his wrestling and fisticuffs gonna do against an opponent who is three times as large and strong as him? Puss will hardly survive with his sword, trying to face the Tiger without it is suicidal. He's not bad for what he is, but I'm still not seeing him taking any hits from Armless Tiger Man, who hits hard enough to bend and crack metal. So I'm not sure how much that blunt force resistance is gonna help. And I know for sure he doesn't. His reactions are faulty and have failed him before. Armless Tiger Man can still tag him with his crazy good accuracy and abundance of things to throw. He can't deflect them like he often does because of the force behind them, and doing so leaves him at risk. His speed is no better than Armless Tiger Man's own and his skill is less. His sword won't do much if he ALTM tears him up before he can use it. Armless Tiger Man has the advantage in most stats minus speed where they're about equal. He is more skilled and wins up close, still. He can tag and get him out at long range, or at least destroy his weapon. All in all, this was a good match, but Armless Tiger Man handily wins. Go ahead and open her up! @joewell: Alright time for votes! @wolfrazer: Don't forget to edit the title when you get the chance. Props to Wolfrazer for getting all those gifs, looks like that took some time. Haha thanks. My job was done well then. Huh, an extremely short CaV, still funny af nonetheless. Vote for @joewell, ALTM should be able to down Puss in one shot, and Puss' tiny sword isn't doing him any favours. @joewell: Well it's more of not that he'd target the hand, but the other parts of his body, given that it seems logical he'd know all the other parts more than just the hand. Sorry didn't have time to read, just saw the post. This probably have been a lot better if I wasn't limited in my gif making...alas oh well. Damn, I never saw his solo movie, I am glad to see Puss has some beast feats. But in the end I will give it to @joewell for making a better case for Tiger. Both participants did an excellent job though, best CAV I've seen in ages. That was beautiful! I'll give my vote to @joewell for mostly making the better case by exploiting the minor flaw in Puss's reactions, the pressure point instance (hilarious stuff), and questioning Puss's piercing durability on top of ALTM's other feats. But props to @wolfrazer for the Puss gifs and still did a great job showcasing Puss as a powerful fighter in his own right than I initially presumed cause I haven't seen his solo movie.